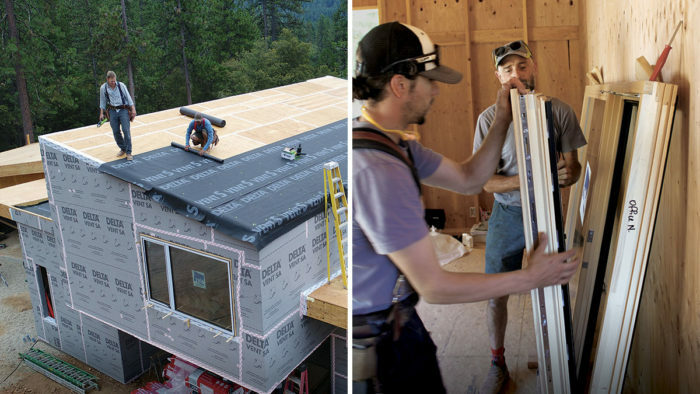 Synopsis: This article is part two of the Fine Homebuilding House: California 2018 build, and describes the envelope details and mechanical systems chosen to make the house as energy-efficient as possible. The article includes details of the mineral wool insulation, window selection, and exterior air barrier, as well as the heating and cooling systems. A drawing of the mechanicals displays how the air-source heat pumps are the heart of the mechanical system along with a low-load HRV. The combination of these efficiency measures and building envelope details helps determine the size of the PV array needed to reach net-zero energy performance. Once the majority of the structural framing is complete, we tackle the critical areas that affect its performance: air-sealing, insulation, and efficient mechanical systems. 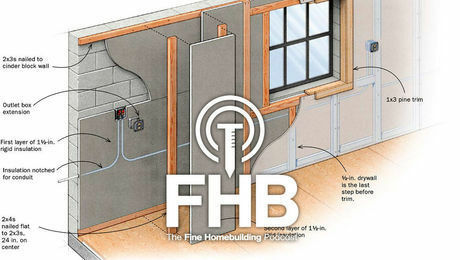 In a house that has a complicated air barrier like ours, some of the air-sealing and insulating happens during framing, so sequencing is key to not overlooking important air-sealing details. Once the performance of the building envelope is maximized and the mechanical systems are as efficient as possible, the amount of PV needed to take an all-electric house net-zero is more attainable. The goal isn’t to just put a lot of solar panels on a roof—it’s to use as little energy as possible and then offset this energy use to create a zero-net-energy (ZNE) home that is also comfortable and healthy. As Dave always says, it makes sense to go after the low-hanging fruit of efficiency first! Our attention to a building’s comfort and efficiency always begins early in the design. Dave models our houses in the Passive House energy-modeling program WUFI to see the effects design decisions have on performance. The energy model—and our understanding of our microclimates—informs our decisions around insulation, windows, and mechanical systems. While our projects, including our home, usually far exceed the Title 24 requirements, we are mindful of the decisions we make along the way. We want to meet our performance goals, but we also pay attention to rebate opportunities in the California Advanced Homes Program by meeting benchmarks that earn a Tier 3 rating (the ZNE tier) and lower the HERS score. On our house, we’re using plywood sheathing for the roof and walls because it’s more robust and stands up to water better than the commodity OSB we see on many local builds. 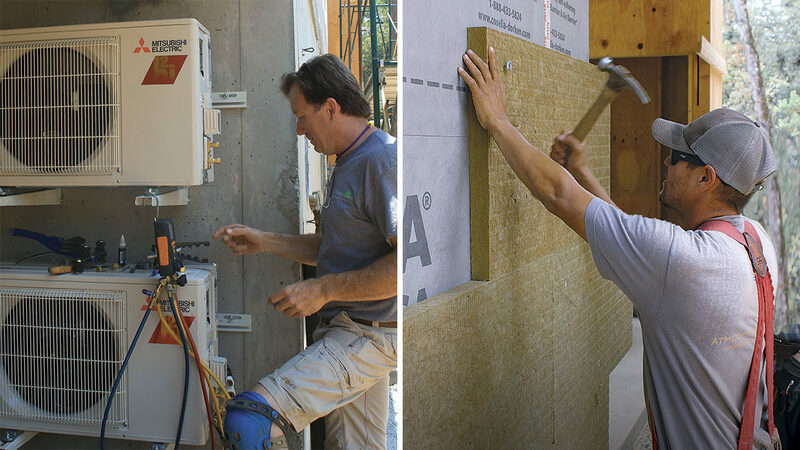 The Delta-Vent SA that we use as a water resistive barrier (WRB) comes in 59-in.-tall rolls so that it covers the sheathing quickly like other building wraps, but this self adhesive product tenaciously sticks to our plywood sheathing, creating an effective airseal in one step. 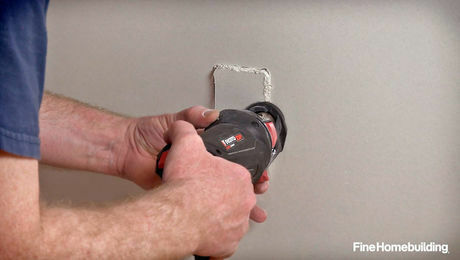 One of things we really like about using this product is that it’s part of a family of products; we don’t have to worry about compatibility issues between flashing tapes and WRBs. And because it’s a self adhesive WRB, it simplifies window flashing by sealing directly to the rough opening without additional flashing tape. The plywood roof deck is the air barrier at the top of the house, as we have an unvented roof assembly. Here we taped all of the plywood seams with Delta Multi- Band as a belt-and-suspenders approach to ensure an airtight assembly. After the seams were taped we rolled out Delta-Vent S (not self-adhering) and underlayment, taped all seams, and taped the edges to the roof deck. Very curious about the dryer vent which appear to have a pipe that exhausts to outside. Where is the make-up air coming from for the dryer ? Low energy costs don’t have to come at a high price. A Vermont architect uses the state’s energy-efficiency guidelines to craft a new zero-energy home steeped in traditional character.